In 1952, Disney produced a rousing live action movie based on the legend of Robin Hood . You would think 22 years later, it would've informed them on how to make an entertaining animated version. Hampered by a limited budget at a studio spiraling down in the years following the death of its founder, 1973's Robin Hood marked the low point in Disney animation. On paper, it sounded pretty fun. 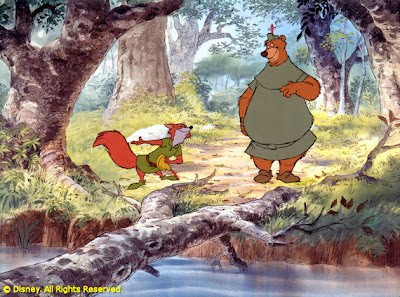 An animated take on the residents of Nottingham and Sherwood Forest with animals playing the characters. Five of the surviving "Nine Old Men" would contribute their talents (producer/director Woolie Reitherman and directing animators Milt Kahl, Frank Thomas, Ollie Johnston and John Lounsbery). Well known Hollywood character actors would do the voices (Phil Harris, Peter Ustinov, Terry Thomas, Andy Devine and Pat Buttram, among others). Popular singer/songwriter Roger Miller would contribute a few songs (and provide the voice of the narrator, Alan-a-Dale). What could go wrong? Robin Hood went so far out of its way to be family-friendly, it jettisoned most of the swashbuckling derring-do that made earlier film versions of the story so exciting. Robin Hood (Brian Bedford) and his hefty sidekick Little John (Harris, still channeling Baloo from The Jungle Book) spend a lot of time just walking, talking and playing tricks on the buffoonish (you can't really call him evil) Prince John (Ustinov). They do get in some scrapes, most notably at an archery contest set up by the prince to capture Robin, but the ensuing chase is so broadly slapstick with runaway tents and crashing elephants, there's little fear that our heroes are in any real danger. Even in the climactic scene where Robin finally confronts the lazy (you can't really call him menacing) Sheriff of Nottingham (Buttram), Robin's final plan of action is not to fight, but to run away. Oh, the sacrifices you must make to keep a G-rating. Disney would redeem itself somewhat in 1977 with the release of The Rescuers, but more than a dozen years would pass after Robin Hood before the animation studio would truly begin to rise from the ashes and be a creative force again. This is part two of my 30-day Disney movie challenge. Tomorrow, we rev up the engine for my favorite Disney comedy. Nothing wrong with being a Disney dork, lol. We all have our favorites. "Robin Hood" just isn't mine.